People that give up their dogs once should not be allowed to have those dogs again! Who are these breeders? These dogs do not deserve this. 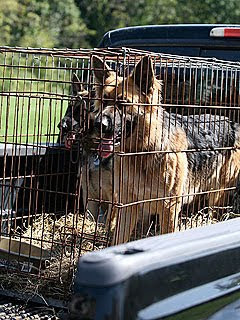 Kate tells People that she is going to welcome back dogs Shoka and Nola, the beautiful German Shepherds that Jon rightly gave up last year when their lifestyle was too hectic and dismantled to give them a good stable home. "It's not fair to the dogs to not be wanted in their own home," Jon said at the time. Absolutely. But Kate will not have them back just yet, but "once the weather warms up." You wouldn't make a child wait until it was convenient for you, why is it okay to make a dog wait? In the meantime, I guess they'll remain crated? In the brief few months they did have the dogs, one of the dogs swallowed a children's toy and had to have a dangerous operation to remove it, and Jon reported that the kids climbed on them, pulled their tails, bit at them and dragged them. The Humane Society of Berks County even investigated the situation for abuse, and we hope they will keep a close eye on this. As a dog lover and owner, I am sick to my stomach. Kate and her next fame fix. That is all she is about. Stirring up drama to keep herself relevant. Just what the kids need. Something else returned and maybe torn away again when it doesn't fit Kate's plan. Actually Kate gave up the dogs. She stated in one of her little speaking appearance that she didn't have time for the dogs and that she was too busy caring for 8 kids. She also stated that the dogs were locked up in their cage and would sometime break out of it. A METAL CAGE! The dogs were locked up for so long that they BROKE OUT OF THE CAGE. Sorry but giving the dogs back to Kate would be ANIMAL CRUELTY. Well, this does not bode well for those of us who do not want the kids filmed. I'd bet money that that's why the dogs are coming back. Kate does nothing without a plan--the children being spotted in matching outfits and the return of the dogs most likely means that some kind of filming will be taking place at the home. Those poor kids probably don't know what is permanent in their lives anymore--how confusing for them. Mommy Dearest playing her game again. Its all image building, "...look everyone, I'm a good mommy, look, I'm bringing the dogs back..." She is so full of BS! Kate supporters bashed Jon about sending the dogs back BUT KATE bragged in one of her speaking engagements that SHE DECIDED to send the dogs back because she was too busy taking care of the Gosselin 8! LIAR! The nannies to take care of the kids, a gardner to takes care of the yard, a chef cooks the meals. Guess the dogs interfered with her weekly manicure/pedicure, tanning, spa sessions. It is definitely animal cruelty to send those dogs back. It will also be child abuse to bring the dogs back AND when the kids misbehave or don't perform for the cameras, Kruella Kate will threaten them with sending the dogs back. Kate is her own worse PR. She doesn't want the negative attention, "it is destroying her" but yet she gives an interview with that rude, cocky attitude and deliberately says stuff to keep herself on the hotseat. Kate go cry to your married bodyguard. I do not want to hear it. The dogs are coming back? After six months? Where have they been all this time, at a kennel? How sad. I'm glad for the children but not so much for the dogs. I hope they have been trained at least. SchmeckyGirl, the dogs went back to the trainer who sold the dogs to the Gosselins. Remember the Christmas gift to the kids episode? Check out JJ's blog, she posted a video as to WHY Kate sent the dogs back to the kennel. It will still be a sad situation because Kate could probably use the dogs as a threat to the kids if they don't behave. Then back to the kennels for the dogs. If it doesn't make her money & fame, they're useless so she throws them away. I am so disappointed in this breeder ! I had hoped that these fine dogs had found a very loving forever home. I am very distubed to know that they have neen shut up in the breeder's kennel for all these months. Kate had more than enough money to hire someone to take care of the dogs, just like she has 5 "babysitters" for the kis, and housekeeper for house, chef for cooking & freezing meals, gardener, pool man etc. Gosselin Dogs to be Reunited With Kids! When the Weather is Good...? With all the changes happening in those kids lives (divorce, battles, goodbye Papa to the arms of a new GF, goodbye Mama to DWS, goodbye reverse mullet madness of Kate's hair), Kate has decided that bringing back the dogs is the best thing for the kids. "My kids' lives have been changed and compromised and altered enough over the past year," Kate Gosselin tells PEOPLE. "I realized if I had two difficult kids I wouldn't send them away and ask for new kids." Wait, this took you 6 months to figure out? Oh Kate. With all the Ed Hardy cigarette madness of your ex-husband, I forgot that you're crazy in your own right. Last year was a stressful time for all the Gosselins. It's possible that Kate felt overwhelmed and just didn't think she could devote the time the dogs needed. I am hoping the breeder spent time training the dogs and everything goes well with their return to the family. Yes, but the whole point is the dogs should not be used as PR ploys. Kate could care less about the dogs. She cares about her Public image and she just brought it up in the article to swirl drama. There is no reason to bring back the dogs. Kate treated them terribly and then we she wasn't gonna have her way with the show she exiled them. They need to just stay where they are. The woman has 8 kids to take care of remember? Well, I sure do hope that this is Kate and her fake take on thing and the dogs do not come back. I'm for the dogs. Yes, the kids ( or at least, some of them) will be happy to have the dogs come back. But, the dogs have been gone for 6 months. They will have grown considerably. They won't be used to the 8 kids any more. Who knows if they were trained at all while they were gone. If you want to have dogs be part of your life, you would be better off training and putting the time in with them and creating that bond. People have to learn how dogs think. Dogs are incapable of thinking like humans. Humans have to learn that and then, learn how to get dogs to do what they want. Frankly, they should have put both dogs in dog school when they 1st got them. And, they should have taken all 8 kids to school with the dogs. When we were doing puppy classes, our teacher included your kids in the training. So, your children learned the correct words and hand signals. My oldest grandson, when he was 2 1/2, held his hand up, said stay! forcefully and all 3 of my boxers stayed and waited for him to release them for their stay command. He was 2. Kate should have called the dog whisperer. "Last year was a stressful time for all the Gosselins. It's possible that Kate felt overwhelmed and just didn't think she could devote the time the dogs needed." When I got my dog from a Rescue two years ago, they had me fill out a lengthy questionnaire before approving me (as well as a home walk-through). On the questionnaire were a bunch of questions that really made you think about what kind of committment you were willing to make to your puppy. They wanted to weed out the wishy-washy people like the Gosselins who only wanted a dog if it was convenient for them. 1. If you move, can you take the dog? 2. If you and your significant other break up, can one or the both of you take the dog? 3. If the dog has behavior problems will you give him up? 4. If you get sick will you give him up? 5. If you have another baby will you give him up? 6. If the dog develops special medical needs will you give him up? If you answered you would give up the dog to any of those questions, you're not ready for a dog and have no business getting one. It's not fair to a dog to offer him anything but your 100 percent committment. Otherwise, let the next family adopt him. WAIT! Maybe they are coming back for a cross over show with the National Geographic Channel - they can have Caesar Milan come to the McMansion for "The Dog Whisperer." Yes, you are suppose to make a commitment to your dog. These 2 dogs could have been very useful to their family. They are guard dogs. That's how they think. We have 3 boxers. Our house has never been broken into.....even when other houses were broken into in our neighborhood. Burglars do not want to take a chance on breaking into a house with dogs. Our dogs do not even have to do anything, but, look out our window and watch. These dogs would have been protective of the kids, too. No one would have been allowed to get close to the kids that the dogs did not approve of. They are smart dogs. Dogs are very instinctive creatures. They size you up even before you open your mouth. But, at this point, being gone for 6 months, I wish they would let the dogs be adopted out. Julie, here's my response from JJ's blog. Just in case you didn't get the memo. Did you watch the video & hear Kate's excuse for sending the dogs away?!! What part didn't you understand? 1. Jon & Kate agree to GIVE the kids puppies for THE KIDS CHRISTMAS GIFT! Remember this!! PAY ATTENTION!! 2. The Gosselins goes to the breeder to choose the puppies. 3. The puppies are the KIDS GIFT BUT Kate jumps in to choose the 1st puppy (the camera's zoom in on her behavior). The kids fight over the 2nd puppy. The came is on Kate and the puppy of HER choice. Meanwhile, the kids are fighting and crying. 4. Kate names BOTH puppies. The kids have NO CHOICE. But the puppies are the KIDS Christmas gift. 5. The puppies go home. Kate FREAKS out because the puppy pees on the floor. Kate shreiks, scaring more pee out of the puppies. 6. J&K go through a messy, public separation & divorce. 7. KATE decides to send the puppies away! She 'doesn't have time to take care of them.' Ha, ha, ha! She's so funny. She had a full staff of nannies, a chef, a gardner. Time for spa treatments, mani/pedicures, tanning sessions BUT no time for the puppies. 8. She wanted Jon to do the dirty deed. 9. DWTS, media blitz, travel, hair extentions, negative press. 10. Damage control / image repair...quick, bring the puppies back! When DWTS practice/travel is finish, oops I mean, the weather is warmer. Kate is a shrewd woman, everything she does is calculated. IF she REALLY wanted, the dogs would be home NOW. After all Nala & Shoka were the KIDS CHRISTMAS GIFT. Her PR team is madly scrambling to repair her image. It's all business, it NOT about the kids. Jon was bashed, relentlessly, about the dogs BUT it was KATE's decision to send them away. Trying to deflect Kate's decision on Jon appears to passively place blame on him for Kate's dirty deed. REMEMBER, the dogs were the kids CHRISTMAS GIFT therefore, the dogs should have stayed on the property, with the kids. Jon moved out because they were living a LIE imposed on Jon by Kate & TLC. Stop making excuses for Kate's decisions and behaviors. Intelligent people see through her LIES. Kate gave up on her marriage. Kate gave up on the dogs once already. Kate will give up on the dogs again, I think. And, that will just make an already bad situation even worse for her kids, the dogs and her pr team. Let the dogs be! Based on all of Kate's past relationships with people and animals, she gives every indication that she just may give up on her kids, too. If they start getting in her way, she might just send them off to boarding school. She is just fine with letting nannies raise them now. How about when they are older if Kate does manage to make it in show biz? I don't know how the kids can have a healthy relationship with these dogs now, living in constant fear that if they dare to love them again, they will be ripped away from them. Actually I don't know how they can have meaningful relationships with anyone, much less an animal, knowing that as soon as they get attached their mother could take that person away. Beth, Aunt Jodi, the grandparents, the nannies, the film crew, need I go on.